Plucky, purple-haired Isabella, star of the New York Times bestselling picture book series, is back for another adventure! When Isabella has a day off from school, her parents suggest going somewhere special. 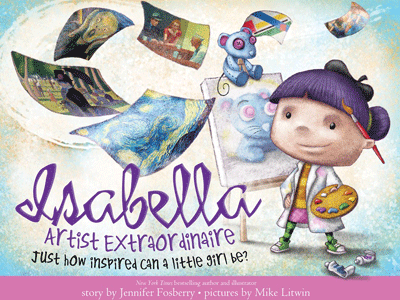 Isabella knows that home is special, but she humors them anyway and begins to imagine places they could go, turning to some of history's most famous artists for inspiration. Perhaps they could go to The Boating Party, see Dancers In Blue, or admire The Starry Night.